The following are the key takeaways from the roundtable regarding formulary data and coverage information like prior authorizations. We will follow up with an article on physician views regarding the future of real-time pharmacy benefit information that is in early development across the industry. 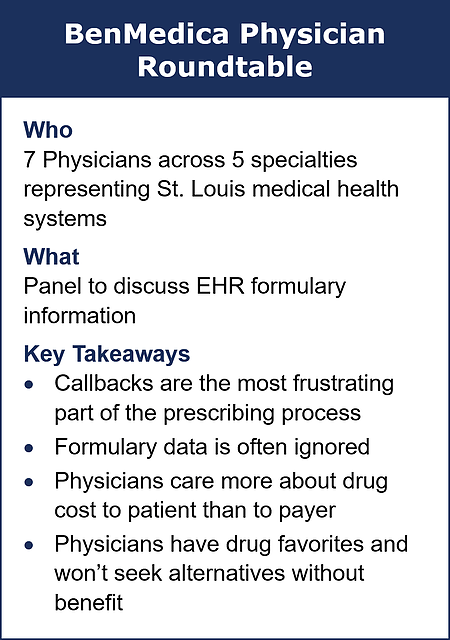 Roundtable physicians did see value in having formulary data built into their EHR workflow. They also reported using the data as part of almost every patient visit. As stated above, high copays or in deductible drug costs cause calls from patients and pharmacies. Knowing the approximate cost (either copay or estimated drug price) during the prescribing process allows our roundtable participants to make informed changes to lower cost alternatives. The threshold of a copay difference needed for a change in prescription was about $50. For a savings of $10, physicians were not willing to change a prescription if the current medication was working. The physicians felt that any copay information, even relative or approximate patient cost, was better than nothing. About half the roundtable perceived difficulty in payers’ ability to determine exact patient costs including the deductible. The roundtable also agreed that knowing payer drug costs was not as useful as patient copay information unless they were in an ACO where prescription drug spend is at risk. The roundtable also discussed the challenges they experienced when using the formulary data present today in their systems. Most of the roundtable physicians indicated they have had their confidence shaken in the accuracy of formulary data. Too often the information provided was outdated or had other issues that caused pharmacy calls. Examples included incorrect formulary status, missing prior authorization requirements and/or lack of information on step therapies. Nearly all of the roundtable physicians were experienced with e-prescribing, but the formulary information provided was sometimes confusing depending on the payer involved. While physicians reported that seeing only formulary levels was valuable, tier level or copay information provided a better sense of the drugs that might meet a patient’s medical and financial needs. Roundtable physicians noted that information about alternatives was present in their EHR. The alternatives specific to a payer had the potential to be useful but either were not appropriate alternatives to the current drug selection or were simply first line generics that had already been considered for therapy. The selection of alternatives needs improvement to provide helpful clinical and cost information to physicians when selecting medications. Need to Gather Physician Insights for Your Plan? We believe that all health plans would gain valuable insights from their own physician roundtable centered on EHR formulary issues. Contact us for a complimentary copy of our question set and leader’s guide to use as a starting point for your group. We can also facilitate your roundtable to help you glean the insights needed on how your physicians perceive your formulary data in their EHRs and what obstacles must be overcome for money-saving outcomes. BenMedica assists health plans and payers with optimizing the data sent through Surescripts and other connections to EHRs for use by physicians. We have deep experience developing processes to best leverage existing data so relevant copay and formulary information, along with preferred alternatives and custom messaging, reach physicians at the time of prescribing. If you are interested in learning more about the solutions BenMedica has in place to assist payers with delivering the right information at the right time, please contact us. For updates on our work optimizing payer information for physician use, follow us on LinkedIn. Bruce Wilkinson, the founder and CEO of BenMedica, has leveraged technology to facilitate healthcare since the birth of electronic prescribing and physician connectivity in 2002. Bruce has extensive industry experience with Accenture, Express Scripts, ZixCorp, and CVS Health and continues to lead the development of healthcare standards through NCPDP. Connect with Bruce on his LinkedIn page.